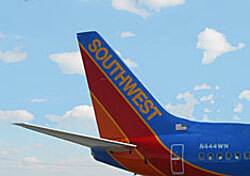 Budget carrier Southwest wants you to think of it as more than a no-frills airline. That’s all well and good, but what are we to make of the fact that it still doesn’t offer any actual frills? I raise the question because today’s Dallas Morning News ran something of a puff piece about the Dallas-based carrier’s efforts to be seen in a more positive light. The article speculates that with so many legacy carriers “taking freebies away, cutting costs by eliminating pillows, selling snacks and even experimenting with charging for soft drinks,” Southwest might just come out smelling like roses. One problem: The only reason Southwest isn’t cutting perks like everyone else is that Southwest has never actually offered any perks to begin with. Certainly Southwest’s recent spate of commercials (where a hapless traveler on another airline finds himself in a world where all airline amenities are coin-operated) are amusing. But the ugly truth, as far as I’m concerned, is that Southwest really is no better than its competition—and in some cases is a lot worse. For all the abuse that JetBlue has suffered lately, at least it offers more legroom and personal televisions. So does Denver-based low-cost carrier Frontier. Southwest can point fingers all it wants, but here’s the truth: For more than a year it has consistently led the charge on fare increases without adding so much as one single seatback television screen. The fact that it now wants to be seen as a “frills” carrier is laughable at best, and flat out misleading when you come right down to it.